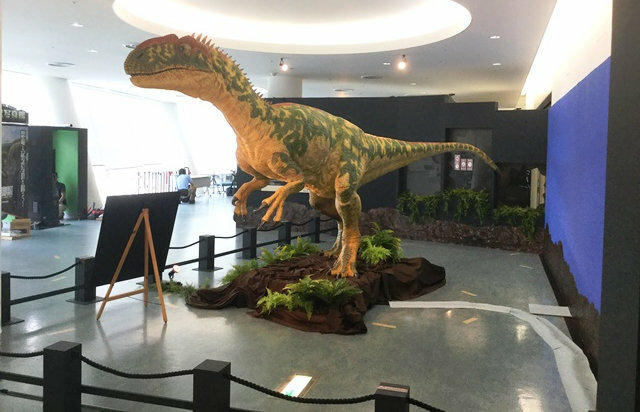 The fossilised bones of the meat eating Neovenator are featured in a new exhibition at the Fukui Prefecture Dinosaur Museum’s exhibition – Theropods: from Carnivorous Dinosaurs to Flying Birds. A dinosaur found on the Isle of Wight has travelled 6,000 miles across the world as part of a special exhibition in Japan. The fossilised bones of the meat eating Neovenator, including parts of the skull and feet, are featured in a new exhibition at the Fukui Prefecture Dinosaur Museum’s exhibition – Theropods: from Carnivorous Dinosaurs to Flying Birds. The showcase – which includes specimens of feathered dinosaurs from China – opened on 13 July and will run until the end of October. 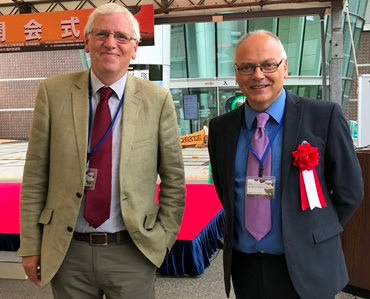 Dinosaur Isle Museum curator, Dr Martin Munt and chair of the Friends of Dinosaur Isle, Dr Jeremy Lockwood (pictured below), travelled to Japan to install the precious cargo and took part in the exhibition’s opening ceremony. “It is a real privilege to have been invited to Japan, to one of the world’s leading dinosaur museums. The museum is a wonderful collection of dinosaurs from around the globe, and it is genuine reflection of the global importance of our collection here on the Island that our fossils are the most prominent part of the exhibition. A life sized reconstruction of Neovenator is on show, including a new animatronic version, specially commissioned for the exhibition. The model was the result of 3D imaging of the original specimen which took place at Dinosaur Isle Museum, earlier this year. A painted scene from the Isle of Wight, 130 million years ago, features at the entrance to the exhibition and on promotional posters. 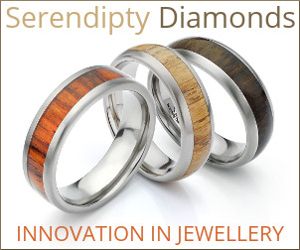 The exhibition is sponsored by media company Yomiuri Shimbun, the biggest media group in Japan. Fossil remains of the apex predator Neovenator were first discovered on the Island in the 20th century. The dinosaur could have existed alongside other dinosaurs found in the Wessex Formation of the early Cretaceous period, (144 million years ago) such as Baryonyx, Polacanthus and Iguanodon. The bones were mixed with those of the plant-eater Mantellisaurus. The dig site also contained remains of fish, amphibians, lizards, pterosaurs and Goniopholididae – a type of early crocodile. If you would like to go on your own fossil hunt with the Dinosaur Isle, Sandown, please contact (01983) 404344 or visit the Website.